Long known for its bike culture and artisan brews, downtown Portland restaurants are attracting some of the most innovative chefs from around the world, and have emerged as premier destinations for exciting cuisine. Portland restaurants are regular features in Sunset, New York Times, Food & Wine, and many other national publications, where neighborhood gems are showcased for their fresh, local ingredients. Known for award-winning farm to table dining, these downtown eateries are within walking distance to lovely parks, gardens, and shops. Located on the 30th floor of Unico US Bank Tower, Portland City Grill offers amazing views of the city and Cascade Mountains, as well as fresh seafood, steaks, and grilled meats. Northwest, Island, and Asian influences are on display at this award-winning destination restaurant. Higgins on Southwest Jefferson has supported regional, sustainable cuisine long before it became a national trend. Chef-owner Greg Higgins is a James Beard Award recipient, and is committed to “maintaining relationships with the local farming community.” Higgins has become a mainstay for Northwest regional cuisine. 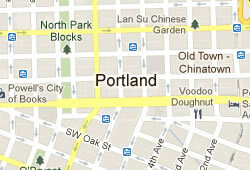 Just south of the Hawthorne Bridge lies Veritable Quandary, which has been serving Portland since 1971. Known for its stunning waterfront views and intimate setting, VQ’s Annie Cuggino creates menus inspired by her New York and New Orleans background, blending them with fresh, Northwest ingredients. Southpark Seafood Grill off the South Park Blocks has earned recognition from The Oregonian, Bon Appétit, New York Times, and Sunset for its local, fresh fish and oysters and commitment to green and sustainable practices, including supporting organic farmers like Singing Pig Farm, Prairie Creek Farms, and Plants Beautiful. In addition, Southpark has been certified by the Green Restaurant Association, and has earned a Recycle Works Award from the state’s office of Sustainable Development. From the time of its opening in 2007, Clyde Common has been racking up awards by local and national publications including Willamette Week, Food & Wine, Portland Monthly, and Esquire. Named one of 38 Essential Portland Restaurants by Eater PDX, Clyde Common is a European-style tavern run located next to the hip Ace Hotel. Grüner on Southwest 12th is “cozy alpine cuisine” where “Old-world comfort meets new-world sophistication.” As one of Eater PDX’s 38 Essential Portland Restaurants Grüner’s culinary palate includes dishes from Germany, France, Switzerland, Austria, and Northern Italy. Named the #4 Top New Restaurant in the country by GQ, Rising Star by The Oregonian, and Food Republic’s Top 5 Great Places to Eat in Portland, Chinatown’s Ping includes food from Asian cultures such Singapore, Malaysia, Vietnam, Bangkok, Tokyo, and China. Located on the North Park Blocks is Park Kitchen. Winner of the 2004 Best New Chef Award by Food & Wine, Scott Dolich uses seasonal ingredients to “create food that is very personal – dishes that reflect and are inspired by our surroundings.” In addition to Food & Wine, Park Kitchen has been recognized by the James Beard Foundation, GQ, and Zagat. Northwest Glisan’s Andina serves New Peruvian cuisine that has been recognized by Willamette Week, The Oregonian, and Sunset. Using traditional culinary styles to create “Novoandina,” or the equivalent of Northwest regional cuisine, Andina embraces native, pre-colonial ingredients and techniques. They have a formal dining area and more casual “Bar Mestizo” that hosts live music.